So, today when I got in to work, it was superduper cold, only in the 20s. Even as I type this now (admittedly late), it's like 26 degrees outside. Then you think about the guys at Valley Forge, who spent seven winters there, they had like two years of severe cold...meaning single-digits lows and low-double-digit highs. That's insane. 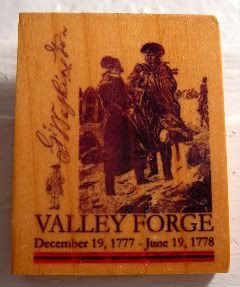 I mean, thank goodness Valley Forge is in Pennsylvania, rather than someplace like wintry Minnesota! Still, I can't even imagine having to spend the winter standing around sad little campfires, with holey uniforms (if that) and holey shoes (if that), with no real rations to speak of, fighting for a cause that they weren't even sure would be successful. Sheesh. But, thankfully, they kept up the fight, cuz otherwise, who knows what the alternative would have been. Lately, I've been thinking a lot about what's worth fighting for and what's easier left alone. I have no real answer. Just that we all sort of have those opportunities and challenges to sort through, and sometimes, it would be nice to be able to see the outcome before deciding that something's worth falling on a sword. Trouble is, sometimes it feels like I'm walking through a field of swords, and it's foggy out there.